Is Gold a Hedge Against Inflation and Currency Weakness? Until the Fed announced an expansion of its quantitative easing program two weeks ago, gold had begun to fade into relative obscurity. Sure, gold had risen in value from a low of $710/ounce back up to $900/ounce, but prices were still off 10% from the highs reached in 2008. Meanwhile, risk aversion had begun to decline and the stock market had begun to rise, such that pundits were talking more about stocks and less about gold. Since the Fed’s announcement, however, gold has been thrust back into the spotlight. The same trading session that saw a record fall in the Dollar and a record rise in Treasury prices, also witnessed a 7% spike in gold futures prices. ” ‘Money is being pushed into the system and that’s creating the inflationary threats that the markets are contemplating…Commodities are a decent way to hedge against that potential threat,’ ” observed one trader. With the exception of the perennial gold bulls and conspiracy theorists, the short-term consensus is that due to “massive spare capacity now opening up in the global economy, soaring unemployment and a dysfunctional banking system – it would be very hard for central banks to generate a surge in inflation even if they wanted to.” This analyst further argues that the Fed is undertaking the expansionary program under the implicit assumption that it will have to siphon this money out of the financial system, if and when the economy recovers. Ascertaining a relationship ultimately depends on the time period of analysis, and the currency(s) in which prices are being tracked. Given also gold’s notorious volatility, it probably makes sense to use special inflation protected securities, rather than gold, as an inflation hedge. This marks an about-face from current policy and recent rhetoric, in which the ECB insisted that guarding against inflation was more important than providing economic stimulus. In fact, Jean-Claude Trichet, President of the ECB, has recently found himself on the defensive: “I don’t think it is justified to say we are doing less on this side of the Atlantic. We have automatic stabilizers,” he said during his quarterly testimony in front of European Parliament. In fact, the ECB had become an outcast among Central Banks for waiting a long time before finally agreeing to cut interest rates. Since embarking on a program of monetary easing, it has been playing catch-up by cutting rates at breakneck speed. It appears that the ECB’s arm was twisted by the most recent economic data; a sudden drop in German manufacturing suggests that the recession is both spreading and deepening. Combined with a record drop in the EU economic sentiment, this “suggests that the euro zone economy will have contracted by roughly 2 percent quarter on quarter in the first three months of the year.” In addition, both producer and consumer prices have eased, such that inflation has fallen well below the 2% target level, and the ECB lost its last excuse for not dropping rates. You have probably seen the advertisements – “Trade Forex with 400:1 Leverage” – without being entirely clear as to what exactly these brokers are offering and/or wondering why someone would want to leverage trades to such an extent. When trading a strategy that is based on technical analysis, “Even though you find one with 80-90% successful system on the paper, when you trade it usually come down 60%. So if we are losing at 40% of the time it is essential that we control risk.” Accordingly, putting more than 3% of your capital at risk on a given trade would seem suicidal. Applying more than 20:1 leverage (which seems trivial compared to 400:1) is very dangerous when you consider that a relatively benign 25 pip decline would result in a 5% loss. 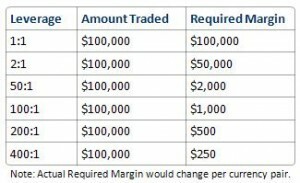 You can use the matrix below to calculate a “worst-case” scenario and figure out how much leverage you can get away with in the event that your trading strategy fails on consecutive occasions. It is surely much lower than you expected! To give you an idea as to how excessive forex leverage has become, consider that the Financial Industry Regulatory Authority (FINRA) recently submitted a proposal that would prevent retail forex brokers from offering customers more than 1.5:1 leverage. While it’s possible that “The FINRA proposal sadly appeals to the lowest common denominator: the people who over-leverage positions with inappropriate stop-losses,” it nonetheless serves as a testament both to the danger of excessive leverage and to the importance of adequate risk management. If you read analysts’ coverage of the Dollar decline (and consequent Euro rally), there is an even divide over whether it is sustainable. Economic data and technical indicators paint a nuanced picture, such that this kind of uncertainty is understandable. On the one hand are the the Dollar bears, who point to an economic recession that continues to deepen, and the seeming complacency of the Federal Reserve Bank towards inflation. If there is any doubt as to how the forex markets feel about the Fed’s plan to purchase over $1 Trillion in US government bonds, consider that the the Dollar just recorded its worst weekly performance in 24 years, while the Euro simultaneously recorded its strongest week since its inception in 1999. There’s not much nuance there. The Empire state manufacturing survey plunged to a record low in the month of March while Industrial production fell 1.4 percent, driving capacity utilization back to its record lows. Foreign investors reduced their holdings of U.S. assets by the largest amount since August 2007. Homebuilder confidence held near its record lows in the month of March as the slump in the real estate sector shows no signs of easing. Unfortunately, there is a contradiction in the argument that the Dollar is being plagued both by economic collapse and by the risk of inflation. Writes Marc Chandler, head of FX strategy at Brown Brothers Harriman, “The pessimist camp wants it both ways. The US is going down the same path as Japan, where the end of a real estate bubble led to a banking crisis and a deep economic contraction. And they want to caution that printing of money will boost interest rates, fuel inflation and debase the currency.” He points out that history, as well as common sense, contradict this line of thinking. Those that remain bullish on the Dollar argue that the Euro rally is a function of technical, rather than fundamental developments. First of all, we are approaching the end of a fiscal quarter. As evidenced by the Dollar decline which took place at the end of December, these periods are usually marked by portfolio rebalancing and hedging, such that it’s not uncommon to see large swings in forex markets. From a technical standpoint, when the Dollar failed to breach the $1.30 level against the Euro, many short sellers were probably forced to cover their positions, which accelerated the Dollar’s decline. Bulls are confident that the pickup in risk-taking which catalyzed a 20% stock market rise is here to stay. “The move to the upside came after the government described a plan that will…generate $500 billion, and possibly $1 trillion over time, to buy hard-to-trade and badly deteriorated assets from banks.” The banks will be recapitalized, the financial system is being repaired, and everything will be okay, right? The markets are certainly prone to false-starts. I can count numerous instances of government officials and market commentators insisting that “the worst is behind us.” Nevertheless, if this time proves to be different, it could be bearish for the Dollar, whose role as ‘safe-haven’ currency would likely be eroded by a positive change in market sentiment. Since Chinese Premier Wen Jiabao (as the ForexBlog reported here) expressed doubts about China’s US loans and investments two weeks ago, the markets have been awash in speculation. In hindsight, it seems that the announcement was a political ploy, rather than a harbinger for a policy change. With a few qualifications, therefore, it seems to safe to conclude that China’s foreign exchange reserves will not undergo any serious changes in the near-term. As a result, China’s forex reserve diversification strategy is likely to proceed along two lines: change in duration of loans, and investments in natural resources. “The risk of short-term national debt is comparatively more controllable. China increased its holding of short-term US bonds by $40.4 billion, $56 billion, and $38 billion in September, October and November, respectively. At that time, China began to sell long-term government debt.” Through its affiliates meanwhile, China’s Central Bank is cautiously making stealthy forays into natural resources; see its recently-acquired a $20 Billion stake in Rio Tinto, an aluminum company, as evidence of this strategy. China seems to have fulfilled its promise of a stable currency, given that the Yuan/Dollar exchange rate is one of the few bastions of stability in forex markets. One Dollar trades for approximately 6.83 CNY, about the same as it did last summer. Futures prices, meanwhile, reflect a mean expectation that one year from now, the exchange rate will dip only slightly, to 6.86 CNY/USD. [The inverse is depicted in the chart below]. In fact, there is even evidence that China is fighting market forces by trying to prop up the value of the Yuan. “‘ If this were a market-determined exchange rate, it would now be weakening, because the overall balance of payments looks to be in deficit, but it is not weakening,’ said [one economist]. ‘The implication is that authorities must be selling their dollar reserves in order to stabilise the USD-CNY exchange rate.’ ” Of course, it’s difficult to determine for sure, since the decline in China’s forex reserves that constitutes the basis for this claim could also have been caused by paper-losses on depreciating investments. Within China, there is a core group of academics that continues to insist that China should depreciate its currency in response to deteriorating economic conditions. After all, China’s trade “surplus narrowed in February to $4.8 billion from about $40 billion in each of the previous three months, and in all likelihood will fall for the first time in five years in 2009.” Meanwhile, economists estimate that GDP growth could slow to 6%, a far cry from the 13% chalked up in 2007, and well below the government’s goal of 8%. Unfortunately for the Fed and the Dollar, the last few weeks have witnessed a slight pickup in risk tolerance, as investors began to focus more on fundamentals. If this development took place in the deepest chasm of the credit crisis, investors might have been willing to look the other way, but now they are very concerned that a huge expansion of the US monetary supply could trigger long-term inflation. A less pessimistic way of looking at the Dollar sell-off would be to attribute it to investor confidence that the Fed plan will help revive the global economy, decreasing the appeal of the US as a safe haven for investing. 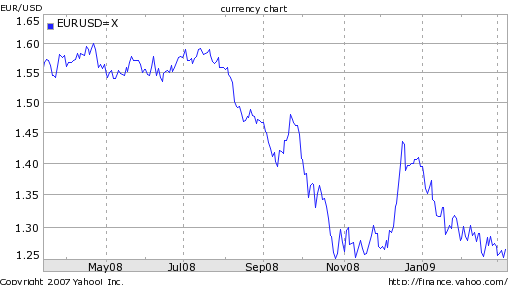 Whether this will push the Dollar down further towards the $1.40 range depends on a couple factors. First of all, will other Central Banks follow suit? “All the major central banks may end up in the same position. The way we look to play it is to see which goes the first and which one lags, and try to explore the timing difference between the two,” explained one analyst. If this proves to be the case, investors will once again focus on the “least worst” currency, in which case the Dollar could once again come out on top. South Korea recently extended a swap agreement with the US, which enables it to exchange up to $30 Billion in Won for Dollars. Investors are evidently hopeful that this represents a step towards easing the Dollar shortage, as the news caused the Won to appreciate by the largest margin in months. Borrowing costs for Korean firms remain high, and the odds remain tilted against them. Unless the US financial system stabilizes and/or Korea is able to run a current account surplus (as a result of increased foreign investment), liquidity will remain a problem. Central Banks Maintain Holdings of US Treasury Securities, but For How Long? President Obama and his new government have adopted a series of measures to deal with the financial crisis. We have expectations as to the effects of these measures. We have lent a huge amount of money to the U.S. Of course we are concerned about the safety of our assets. To be honest, I am definitely a little worried. While the announcement represented political posturing (to an increasingly restless, domestic Chinese audience), it should nonetheless be heeded as a warning, that the US cannot expect China (and other foreign Central Banks) to fund US budget deficits indefinitely. Let’s put aside the rhetoric for a moment, and examine the data. This week witnessed strong demand for Treasury securities, which were auctioned by the Treasury Department on consecutive days. Despite historically low yields (see chart), investors continue to snap up Treasury Bonds, mainly for the sake of risk aversion. The newly-revived issuance of 30-year bonds also went off without a hitch, and were more than 2x oversubscribed. Most relevant to this discussion is the fact the foreign Central Banks accounted for as much as 46% of demand! However, there are a few reasons why I don’t think this trend will continue. First of all, the buildup in foreign Treasury holdings that transpired over the last decade was largely a product of unsustainable global economic imbalances, as net exporters to the US invested their perennial trade surpluses in what they perceived to be the world’s most secure investment. Temporarily putting aside whether Treasuries are actually secure, economic indicators suggest that Central Banks simply do not have the capacity to increase their holdings by much more. China’s trade surplus plummeted to $4.8 Billion last month; one economist projects a surplus of only $155 Billion in 2009, compared to nearly $300 Billion in 2008. 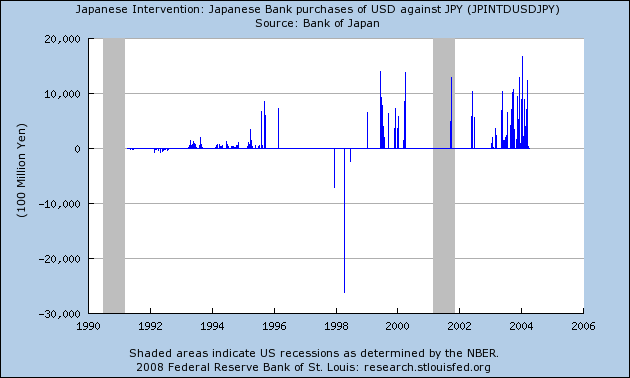 You can also remove from the list Japan- the second-largest holder of US Treasury securities- which is now running a trade deficit. Instead, both countries have publicly announced plans to use some of their forex reserves to fund domestic economic initiatives. Then there is the equally unsustainable short-term buildup in US Treasuries, which is largely a product of technical factors. As I mentioned above- and which should be clear to all investors- the current theme underlying securities markets is one of risk aversion. In fact, it now appears that a bubble is forming in the bond market, and “any exodus now could spark selling across the board. Foreign debt holders would likely repatriate their funds immediately to reduce the risk of being last to convert.” As soon as markets recover- of which there are already nascent indications– investors will probably reduce their holdings of government bonds, or at least not increase their holdings. Even the most conservative projections indicate a cumulative budget deficit for the next few years measuring in the the Trillions. Unless the risk-aversion theme obtains for the next decade, it seems unlikely that foreigners can be tapped to fund more than a small portion, leaving the Federal Reserve (with the help of its printing press) to make up the shortfall. The holy grail of forex is a trading system that can turn a consistent profit, irrespective of the currencies involved and prevailing market conditions. While this has been promoted disingenuously by many a forex broker and forex software provider, suffice it to say that it remains elusive. A more realistic goal would be to build a strategy that is profitable most of the time (i.e. wins more than it loses). I don’t pretend to have developed such a strategy; instead, I would like to outline a method that can be used to confirm (or deny) whether your strategies are strong enough to withstand the daily whims of the forex markets: backtesting. Simply put, backtesting involves applying a trading strategy to historical data. In other words, by checking the parameters that normally guide your trading against the way markets actually performed in the past, you can easily determine the stipulations/conditions that will make such parameters robust. Parameters include time period (hours, days, weeks, etc. 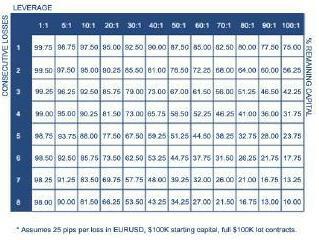 ), expected profit per trade (percentage, or number of pips), cumulative profit goal (i.e. 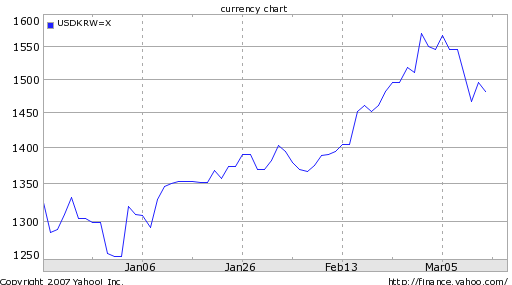 25% annual return) currency pair (USD/EUR, EUR/YEN, etc.) and comfort with risk (i.e. stop/loss). Stipulations, on the other hand, can be as simple or as complicated as you would like. For example, let’s say you want to buy whenever the currency pair breaches its 15-day moving average, and/or sell when the stochastic falls below a certain threshold. These kinds of stipulations can also be qualitative; let’s say, for example, you sell the Euro every time the European Central Bank lowers interest rates, or buy the Dollar every time the consumer confidence index records a rise. The most robust strategies are profitable under a variety of market conditions, when profit goals are flexible. (For example, try adding or subtracting 5 pips to your expected profit per trade, and see if your strategy is still profitable). It is also important to remember that some strategies don’t lend themselves well to backtesting. Trendlines and other technical ‘patterns,’ for example, are often too circumstantial to be applied and tested generally. Backtesting also doesn’t account for market psyschology. While it would be nice to devise a strategy that is profitable in a variety of conditions, sometimes it must be condeded that when market sentiment is especially (and often irrationally) bullish or bearish, one’s strategy may not apply. Having developed the paramaters and stipulations, how can you backtest your strategy? The pioneers (and perhaps even some stalwarts today) manually parsed reams of data, going through daily and weekly charts to determine the sets of conditions, if any, their strategies were viable. With the use of powerful computers, this tedious process can be completed automatically. If you’re not up for building/coding a system yourself, don’t despair, as there are a handful of great programs that have been professionally designed for amateurs to use. Here, you have two main options. You can open a (demo) account with any of the forex brokers that incorporate backtesting software into their trading platforms. Pay special attention to those that use MetaTrader4 (MT4) – of which there are several reputable brokers– because it is the most critically-acclaimed and user-friendly. For those of you who don’t have access to such software, several downloadable versions can be found here, and a quick google search turned up a list of commercial software. Sometimes, such software requires you to provide your own historical data, which can be found here. Yesterday, both the European Central Bank (ECB) and the Bank of the UK cut their benchmark interest rates to record lows. 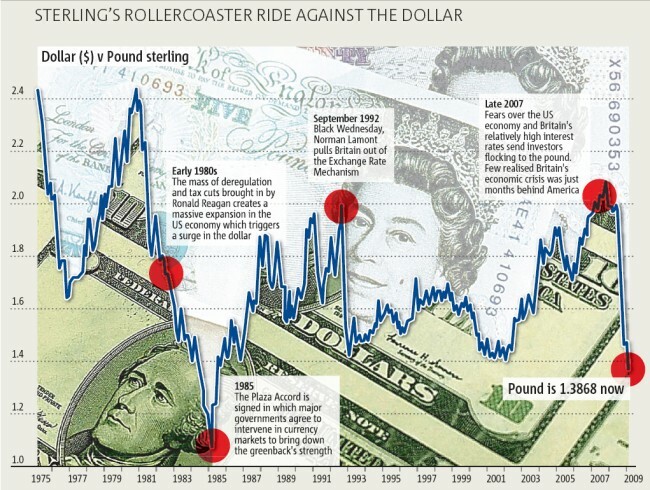 This is especially incredible in the case of the UK, whose Central Bank over 300 years old! You can see from the following chart that both Central Banks have more than made up for their respectively slow starts in easing monetary policy by effecting several dramatic rate cuts, following the example of the Federal Reserve. The baseline UK rate now stands at .5%, only slightly higher than the Federal Funds rate, and slightly lower than the 1.5% ECB rate. The interest rate cuts were announced simultaneously with a spate of macroeconomic data, which collectively paint a bleak picture. Eurozone growth is projected at -2.7% for 2009 and 0% for 2010. The current unemployment rate at 8.2% and climbing. The thorn in the side of the EU is represented by eastern Europe, where growth is falling at an alarming pace, dragging the EU down with it. While EU member states have pledged to intervene if one of their own falls into bankruptcy, it’s unlikely that they would intervene similarly if a non-EU member state went bust. The UK economy is similarly desperate, having contracted at an annualized rate of 5.8% in the most recent quarter. The wild cards are the real estate and financial sectors, the fortunes of which are increasingly intertwined. 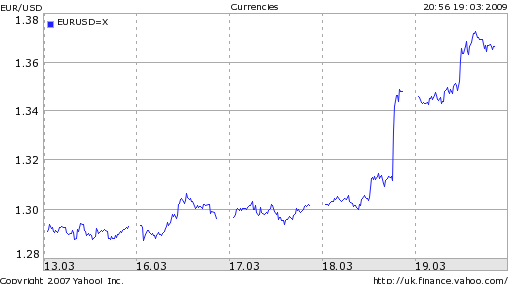 So what do the forex markets have to say about all this? Economists have used the dual phenomena of risk aversion and deflation to explain the interminable weakness in the the Pound and Euro. Everyone is surely familiar with the notion of the US as “safe haven” during periods of global financial instability. The deflation hypothesis, meanwhile, suggests that the ECB (and to a lesser extent, the Bank of UK), fell behind the curve when easing liquidity. The ECB, especially has harped on inflation as a reason for cutting rates more quickly. Given that investors are now more concerned with capital preservation than price inflation, it follows that they would prefer to invest where Central Banks were more vigilant about deflation (i.e. the US). 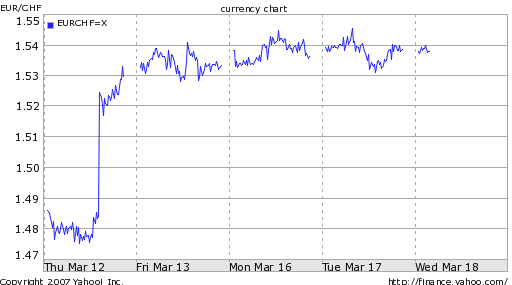 Personally, I think that the continued declines in both currencies, in spite of steep interest rate cuts, indicates that the deflation hypothesis is bunk, and investors remain fixated on risk aversion. By no coincidence, the temporary rebound in US stocks that took place in January was also accompanied by a bump in the Euro. (See chart below). In short, with a medium and long-term investing horizon in mind, I think the ECB’s approach to dealing with the credit crisis is more conducive to monetary stability. Thus, when investors grow weary of the idea of US as safe haven, they will no doubt focus instead on fundamentals. At which point, the ECB will likely be rewarded for fulfilling its anti-inflation mandate, in the form of a stronger Euro. The credit crisis has resulted in a collapse in prices for nearly every type of investable asset class (i.e. 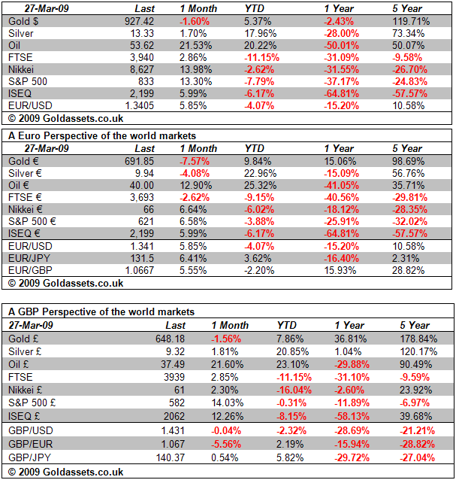 stocks, bonds, commodities, real estate)- with the notable exception of one: currencies. Of course, this is an inherent quality of forex: a rise in one currency must necessarily be offset by a fall in another currency. While you are probably rolling your eye at the obviousness of this observation, it is still worthwhile to make because it implies that there is always a bull market in forex. Accordingly, capital from both institutions and retail investors continues to pour in to the forex markets, causing daily turnover to surge by 41% (according to one survey), which would imply a total of $4.5 Trillion per day! 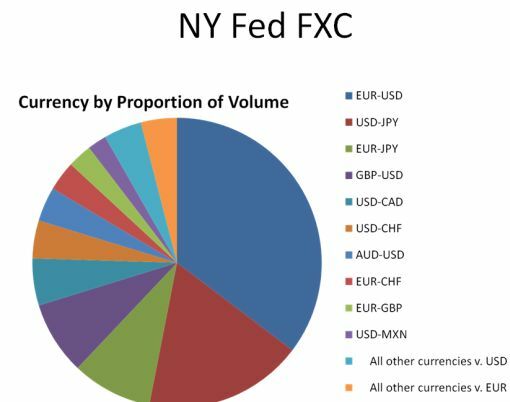 Based on New York data, which generally reflects global forex activity, transactions between the Dollar, Euro, and Yen (i.e. 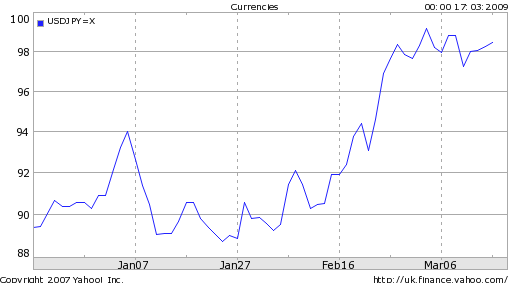 not involving outside currencies) now account for more than half of the total. 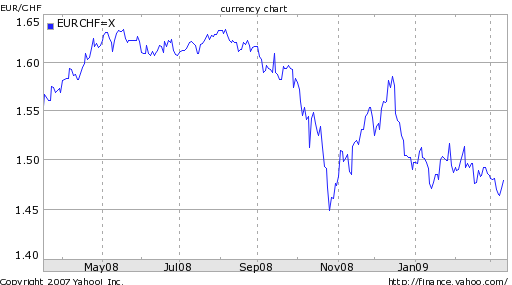 Contrary to popular belief, however, most foreign exchange transactions involve derivatives, rather than spot trades. In the case of swaps, it is the nominal value of the swap that is reported, which well exceeds the total amount of currency that is exchanged, and thus results in an inflated estimate of total daily turnover. Regardless, all measures point to increasing volume. One would expect that the increase in both liquidity and the role of derivatives in forex markets would result in a corresponding decrease in volatility. Of course, this is quickly belied by the turbulence of the last six months, in which many currency pairs set daily, weekly, and/or monthly records for fluctuations and volatility. Will Mexican Peso Crisis of 1994 repeat itself? The main fly in the ointment was Mexico’s current account deficit, which ballooned from $6 billion in 1989 to $15 billion in 1991 and to more than $20 billion in 1992 and 1993. To some extent, the current account deficit was a favorable development, reflecting the capital inflow stimulated by Mexican policy reforms. However, the large size of the deficit led some observers to worry that the peso was becoming overvalued, a circumstance that could discourage exports, stimulate imports, and lead eventually to a crisis. Sound familiar? A future (hypothetical) report that follows the looming currency crisis will likely point to a similar inflow of speculative capital and a surging current account deficit, which has reached the highest level since 2000. 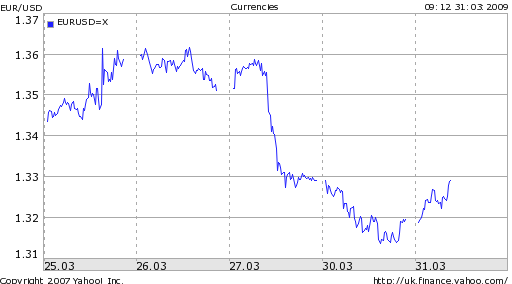 Given that “the size of the deficit may more than double this year as industrial production, foreign direct investment and money transfers from abroad continue to fall,” the likelihood of peso devaluation is rising, regardless of how low the currency has already fallen. On the one hand, Mexico’s response to the weakened Peso is promising. With the blessing of the US (which played a prominent role in the 1994 crisis), the Central Bank of Mexico has injected Billions of Dollars directly into the forex market, so as to keep up the facade that everything is under control. At the same time, it hasn’t lowered interest rates nearly to the extent of some of its peers, in order to guard against inflation and appeal to investors with comparatively attractive yields. 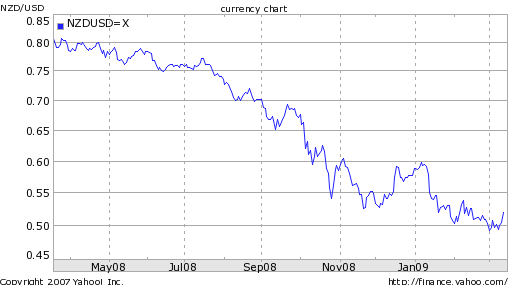 A sudden shift of funds out of a currency is called a speculative attack in the economics literature…Rather than waiting for the central bank’s reserves to run out through a gradual process of current account deficits, speculators who realize that a devaluation is inevitable will attack the currency through massive capital outflows as soon as they command enough resources to force a devaluation. 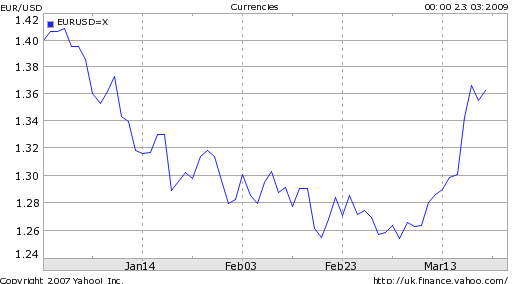 Most analysts have since turned bearish on Mexico, which means the fall of the Peso has become self-fulfilling. Check out the Mexican Peso ETF (FXM), which represents a simple and effective way to bet against (or for, for all of the contrarians out there) the Peso.